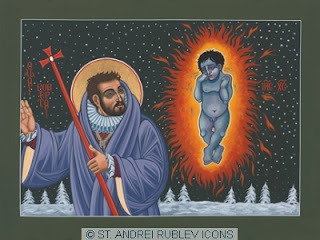 It's become a Christmas tradition for me to blog about "The Burning Babe" by St. Robert Southwell S.J. I'm going to reproduce my post from last year, and then add some extra thoughts. St. Robert Southwell was a Jesuit priest in the reign of Queen Elizabeth who came to England (having been trained on the continent) fully expecting to be martyred-- as indeed he was. He was also a poet, and wrote this classic poem. I love sentimentality, and I love Christmas sentimentality. But there's something even better than sentimentality, and that's awe. Fire imagery has always appealed to me, and this poem is full of it, as the title indicates. It's also (in my view) a rare non-tedious example of a conceit. A conceit, as the reader may well know already, is an extended metaphor. Conceits are the reason I find John Donne and the Metaphysical poets nigh-on unreadable. However, the conceit works here, perhaps because the poem is a short one. The theological density of the poem is also very impressive. 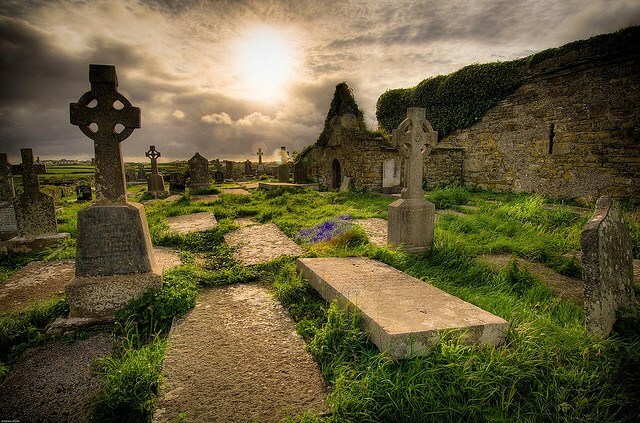 I wonder if anyone has ever compiled an anthology of poetry by saints? Well, welcome back to 2017. I'll just add a few comments about fire imagery. I really do love it! Right now, I'm listening to "Burning Love" by Elvis Presley, whose lyrics are full of such imagery. The stories that move me most in the Bible often involve images of fire or intense light; the burning bush, Pentecost, or the Transfiguration. I've often written about the poem "The Burning of the Leaves" by Laurence Binyon on this blog. My favourite line of that poem, and quite possibly my favourite line of poetry of all time, is the line: "The fingers of fire are making corruption clean." That line sets my imagination alight! Another reason I love this poem is because nothing jars in it. This may be a "negative" reason to love a poem, but it's good enough for me. None of the similes are incongruous or ridiculous, and the metre is smooth throughout. I like "smooth" poetry-- Tennyson, Yeats, Swinburne, Larkin and Christina Rossetti are outstanding proponents of smooth, polished verses. It's rare to find such smoothness in an Elizabethan-- whether that's due to changes in pronunciation over the centuries, or whether it was as true than as it is now, I don't know. Edit, later in the day: I've been memorizing this poem, or rather re-memorizing, in order to recite it. Memorizing a poem may be the best way to savour it! I'm struck even more by how well-constructed it is. This doesn't trip off the tongue-- rather, it trips the tongue up, so to speak. And that's a fault in poetry, in my view. "The Burning Babe" wouldn't be in the front rank of my favourite poems-- it couldn't rival "Ulysses" or "Locksley Hall" by Tennyson, or "To Helen" by Edgar Allen Poe, or "The Burning of the Leaves" by Laurence Binyon. But it's pretty good!